Arrive at Paris International Airport,Paris - The most romantic city of Europe. Be charmed by its magnificent avenues, cozy café life and unparalleled art scene. Transfer to Hotel, Check in. Freshen up and transfer to Indian restaurant for dinner. Overnight in Paris. No Lunch Included On This Day.Please note that Tour Manager may not be travelling with group on flight. Tour manager will be meeting the group at the exit Baggage Claim area or at the hotel if there are multiple arrivals. However either the tour manager or the local representative will be there at airport to transfer you comfortably to your hotel. After breakfast at the hotel get ready for fun filled day at Disneyland Paris. Your ticket entitles you either for Walt Disney Studios where you can discover the magical world of cinema and television at Walt Disney Studios Park. Explore 4 cinemagical studio featuring lots of thrilling attractions and spectacular shows OR Disneyland Park which explores 5 themed lands filled with Disney classic attractions, shows, exciting and adventurous rides and fairytales characters. Packed Lunch. Indian dinner at restaurant. Transfer back to your hotel. Overnight in Paris. After breakfast check out &depart for City Tour of Paris. This will be a magical and magnificent drive through Paris buildings. Visit the landmarks of Paris like Arc De Triomphe, Concorde Square, The Invalides, The Alexander Bridge, The Opera House and Champs Elysees. Indian Lunch at Restaurant. Depart to visit the fascinating Eiffel tower 3rd Level to have a birds eye view of Paris.Later drive to Dijon. Indian Dinner at Restaurant. Overnight in Dijon. After breakfast check out & we depart forVavey. Indian Lunch at Restaurant. Then drive for a photo stop to the Charlie Chaplin. Enjoy some free time in beautiful town. Later drive to Bern – the Capital City of Switzerland. Enjoy the Walking City Tour of Bern which still retains its old world charm in The Clock Tower, the Parliament Buildings and Gothic Fountains. Later drive to Engelberg.Dinner at Indian Restaurant. After Dinner transfer to Hotel. Check in. Overnight in Engelberg/Central Switzerland area. After Buffet breakfast at the hotel depart to Interlaken to visit Jungfrau(WITH ADDITIONAL COST). Arrive and proceed to station to board the cog wheel train to Jungfraujoch - Top Of Europe, a world of eternal ice and snow, located at 3454 meters, Alpine sensation-A 360° cinema has been built in the Sphinx Hall. A film carries visitors into the High-Alpine world surrounding the Jungfraujoch. Visit the Ice Palace and marvel at some of the unique Ice Sculptures and the Sphinx Terrace to have a amazing views of Jungfrau region. Return to Interlaken and then proceed to Zurich. Indian Dinner at restaurant. Overnight in Zurich/Central Switzerland area. After breakfast, Check out and Transfer to Titlis Cable Car Station for an exciting excursion to Mt. Titlis with Ice Flyer. Marvel at the worlds first revolving cable car ride which will take you at the height of 3020 meter, will sure to leave you spellbound. Take a ride on Ice Flyer (Weather Permitting) to Glacier Park where you can enjoy amazing snow activities on top. Dont miss a walk on one of the highest suspension bridge in the world which is 10,000 feet above sea level. Enjoy Indian lunch on top. Later proceed to Lucerne for an Orientation Tour of the city. Later proceed to visit the magnificent Rhine Falls - The largest waterfall in Europe crashes down a 23m (75ft) drop. Indian Dinner at restaurant. Later transfer to Hotel. Overnight in Zurich/Central Switzerland area. 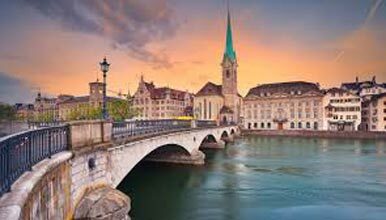 After breakfast check out and transfer to Zurich International Airport to board your flight back home with wonderful memories of your tour. No Lunch And Dinner Included On This Day. 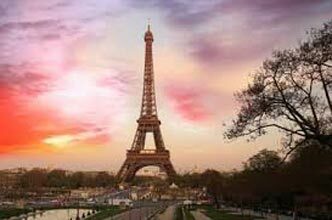 Scenic Switzerland With Romantic Paris Tou..